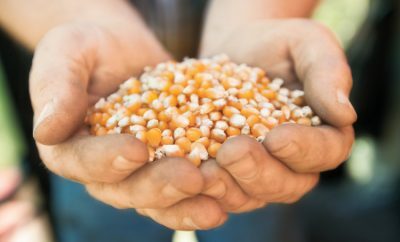 Take a look in your pantry or refrigerator and try to imagine any food within – ketchup, spicy dill pickle, pepperoni pizza, cherry cola, marshmallow, even sauerkraut – drizzled over your next bowl of popcorn. 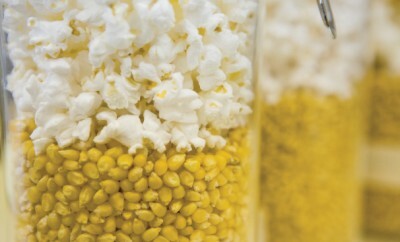 Some of them may sound strange, but since 1989, Carole Buck, owner of Not Just Popcorn in Edinburgh, has done more than imagine these unique tastes of popcorn – she has created 403 of them, including those listed above. Technically, Buck has made 395 flavors. 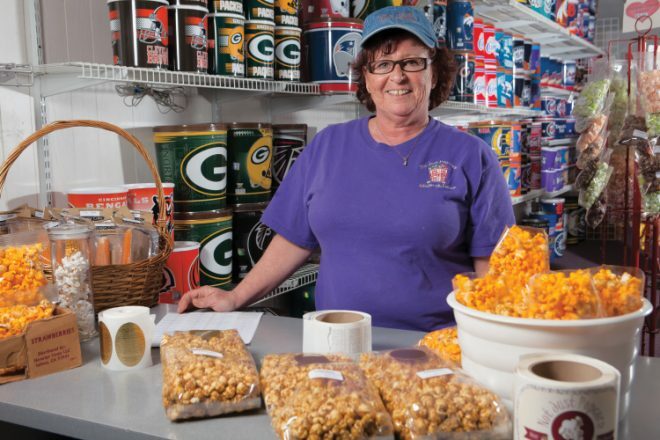 Eight flavors already existed by the time she purchased her store from its previous owner. Today, Buck’s popcorn store, which has been featured on the Food Network, seems to increase its number of flavor options weekly. 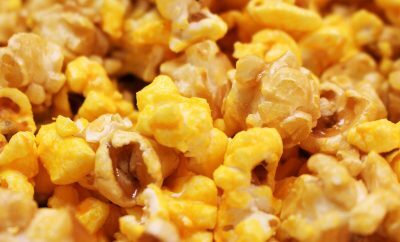 Every taste has its fans, but according to Buck, there are customer favorites like Heavenly Vanilla Butternut – popcorn covered in vanilla white chocolate (no nuts). “It tastes like heaven,” says Buck. Her favorite flavor? Chocolate Toffee Crunch – sweet caramel popcorn covered in chocolate. 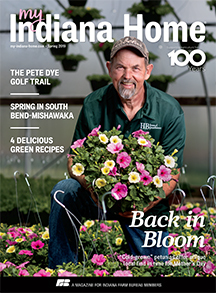 Find 5 more Indiana popcorn shops. Those who ask about shelf life for the popcorn get a quick response from Buck. 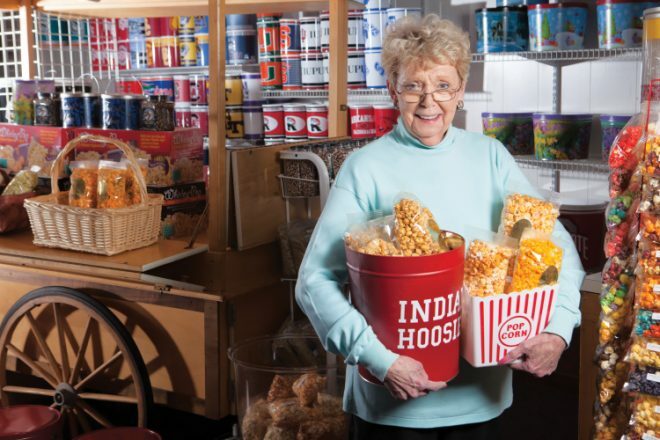 “Once you taste the chocolate-covered popcorn, it has a shelf life of 10 minutes!” she says, adding that normal shelf life for her popcorn products is two months. According to Buck, not every flavor combination to come from her kitchen has been successful. “There have been a lot of mistakes, believe me,” she says. Buck has made the production of popcorn both tasty and educational by giving tours of the Not Just Popcorn factory in Edinburgh. Visitors can walk through the factory to see the process of popping, coating and packaging the various products. The last stop on the tour is perhaps the most popular – a table with samples of various flavors of freshly popped corn. Cost for tours of the factory is $3 per person. Group tours must be scheduled in advance. The Not Just Popcorn store is open seven days a week. Christmas is the busiest season, but Buck is at the store most days and often works 50 hours a week throughout the year filling orders to be shipped or prepared for a local event. 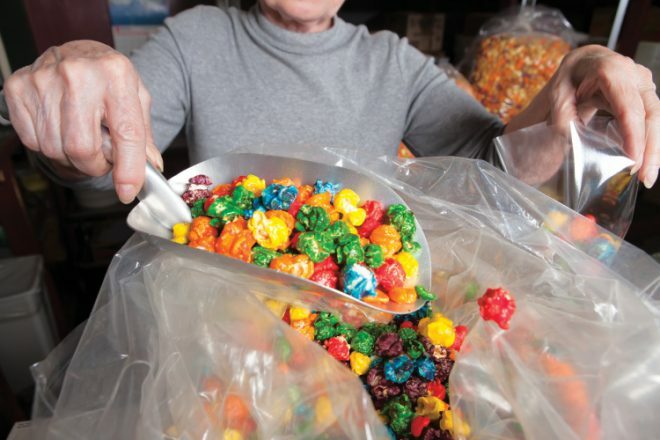 “We offer personalized popcorn gifts for weddings, baby showers, retirement parties, corporate events and other special occasions,” she says. 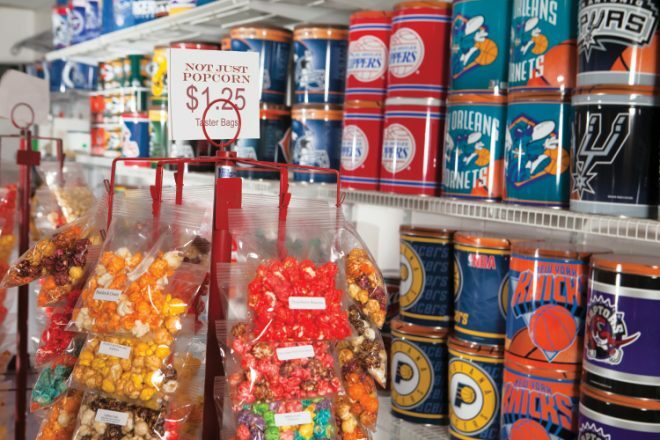 The Not Just Popcorn shop is open Monday and Tuesday from 10 a.m. to 5 p.m., Wednesday through Saturday from 10 a.m. to 6 p.m. and Sunday from noon to 5 p.m.
You can contact the store at 812-526-8256 and visit notjustpopcorn.com for more information. Please call before traveling long distances.